I recently had guests over for the holidays and since my home has fairly poor cellular reception, some asked for a network key to get their Android smart phone onto my WiFi network. Like many people, I have a guest zone enabled on my WiFi router for when friends, neighbors, or relatives need to get online. It is a great feature, but having an extra password to remember is a hassle. In addition, having to repeat a obscure key to person after person is simply frustrating. 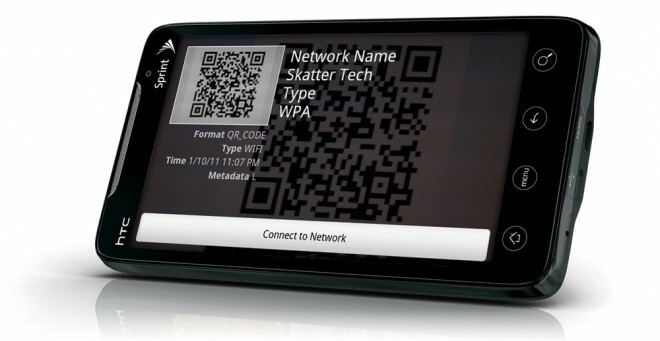 Fortunately, there is a quick solution to make sharing WiFi network keys easy for those with Android smart phones: QR codes. The next time a guest wants to get their smart phone online, just ask them to scan the QR code you printed out. Maybe even pin it to the refrigerator so it never gets lost. Apps including Google Goggles support scanning these QR codes, however I have found great results with the popular Barcode Scanner app. If you don’t use Android, there are alternative QR code scanning apps for platforms including BlackBerry, iOS, and webOS. How do you scan it?